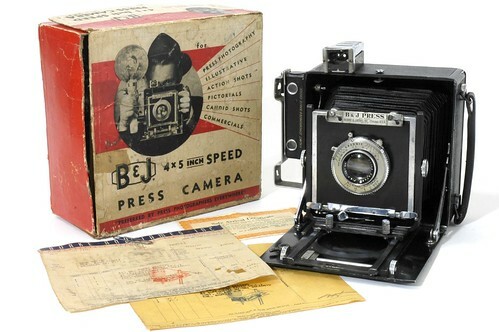 Burke & James' 4x5 Speed Press Camera was a sophisticated folding bed camera offering ground glass focusing or snapshot focusing by means of a focusing scale and a telescopic viewfinder. A Kalart Synchronized Range Finder was often attached to it. It lacked the big sports finder which was the third finder device of many other press cameras. However, the camera had a number of features lacking on some of those cameras, including a rotating back and full front swings, tilts, shifts, and rise/fall movements. In a way the Burke and James Press 4x5 was a cross between a press camera and a technical camera like the Meridian 45A, Meridian 45B, or Linhof Technika. 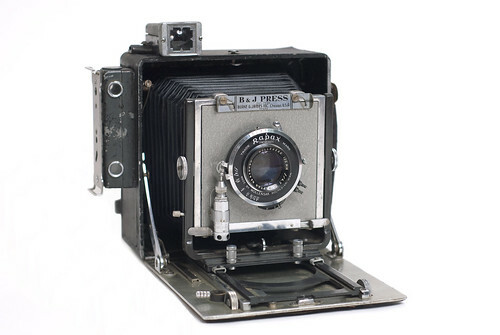 The camera was solidly constructed of aluminum and other metals. As the focusing bed did not extend into the body, the use of extreme wide angle lenses (<85mm) requires the use of a recessed lens board. This page was last edited on 16 February 2017, at 06:28.